I arose, on my last day in Exmoor, to a dank, drizzly morning, so a sunrise was out of the question. After packing up the tent in the rain, always a delightful job, I drove to Porlock Weir so I could begin a spot of rambling along the South West Coast Path. By the time I arrived it was starting to brighten up a bit, with the morning sunshine appearing through the ever thinning clouds. I parked up, and strapping on my camera bag, I took the little track to the coastal path. I was only walking a tiny fraction of it, the entire length of the path is 630 miles, the longest in England, and stretches from Minehead, around the coasts of Devon and Cornwall, all the way to Pool in Dorset. And because it rises and falls with every river mouth, the total height climbed, if you were to complete the route, has been estimated at 114,931 feet, almost four times the height of Everest. I wasn’t about to do that. If you wanted to knock half a mile of the walk to Culbone, then you can drive through Worthy Combe Toll. My destination was the little church of St. Beuno’s, and the hamlet of Culbone, which is mainly comprised of the church, apparently the smallest parish church in England, which is nestled in a remote and peaceful combe and can only be reached on foot. To reach the church I took the steep path through Culbone Woods for two miles. 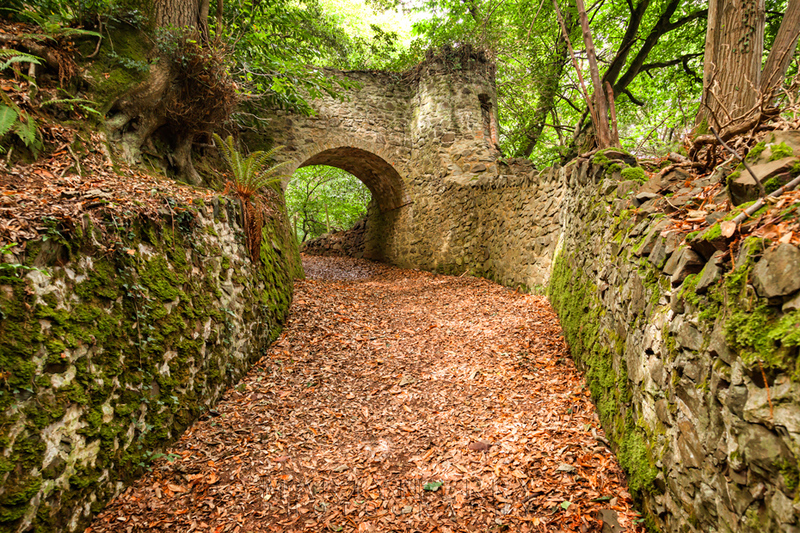 In the 14th century Culbone's woods were used as a colony for French prisoners, and again in 1720 as a prison colony. The woods were once the site of a major charcoal burning industry, the original burners were reputed to be a colony of lepers, who were not an uncommon site in the woods at that time. Although the lepers were not allowed into the village, there is a small leper window, or ‘squint’ in the north wall of the church. 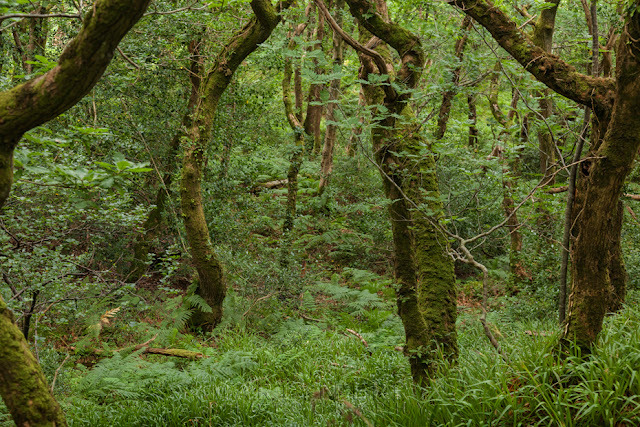 The woods around the village are home to the rare Sorbus vexans, a microspecies of self-cloning Sorbus trees which are only found in the coastal area between Culbone and Trentishoe in Devon. It is among the rarest trees in Britain. Not that I knew what it looked like, so whether I saw any or not I will never know. camera gear, I was glad I brought it along. At some point in 1798, Samuel Taylor Coleridge came along here, having walked all the way from his cottage, about 20 miles away in the Quantock Hills, where he was living with his wife and child. He often did this trip with his friends William and Dorothy Wordsworth, the three of them thinking nothing of walking 40 or 50 miles within a couple of days. On this particular occasion, Coleridge was alone and spent the night at Ash Farm, up the combe from Culbone. And there, that night, he began his great poem ‘Kubla Khan’, composed in a sort of reverie brought on by two grains of opium. The edge of the path drops steeply away down to the Bristol Channel far below. It is thought perhaps the woodland around Culbone may have inspired some of his lines, as the stretch of copse between Porlock and Culbone is incredibly atmospheric. With dense, twisted moss covered trees, perched on a steep incline, and a thick canopy overhead, it’s not difficult, even on a sunny day, to feel a sense of the enclosed, ancient character of the place. Here's a few shots I took of the almost primeval looking forest. After struggling along the path that seemed to go forever upwards, I finally caught a glimpse of the church between the foliage and made my way to it. 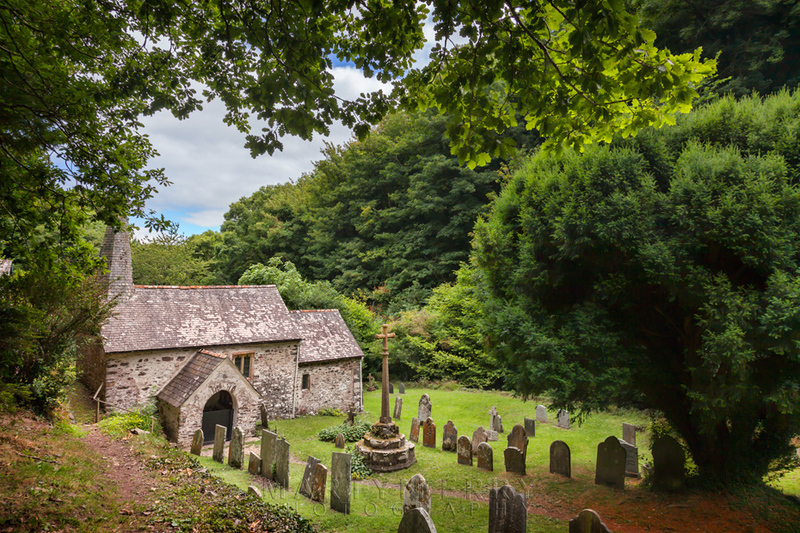 The church is surrounded by trees and a nearby are a couple of houses, all that remains of the village, and although there were a handful of walkers about, in their brightly coloured jackets as usual, it was still very peaceful indeed. I had a bit of a sit down in the cool air, waiting for the church to be vacated, it is a small church afterall, although it’s not as small as Widford church, just outside Burford, which is still in use itself, so I’m not quite sure what the criteria are for smallest parish church in England. The name Culbone is thought to indicate a Celtic religious site, and is a corruption of Kil Beun, or Church of St. Beuno, pronounced 'Bayno.' He was a famous Welsh saint, born in the late 6th century. On Culbone Hill 2 miles to the south-west (on private land) stands the 1 metre high ‘Culbone Stone’ once part of a stone row that stood close by. Carved on the stone is an incised wheel-cross that dates from the 7th-9th century AD, the stone itself being of pre-historic origins. St Beuno probably preached at this stone when he lived for a while in the valley before starting his missionary work in mid and north Wales. A view of the church in all it's miniature glory. The church is recorded in the Domesday Book of 1086 and is almost certainly pre-Norman. While the body of the church is at least 11th century if not older, the porch is probably 13th century, and the nave was rebuilt in the 15th century. Inside are box pews, including a 17th century pew for the squires of nearby Ashley Combe House. Once I’d had a look around, I made my way back along the coastal path to the car and bid farewell to Exmoor, not for too long though I hope. Anglesey Abbey, a look around the house.